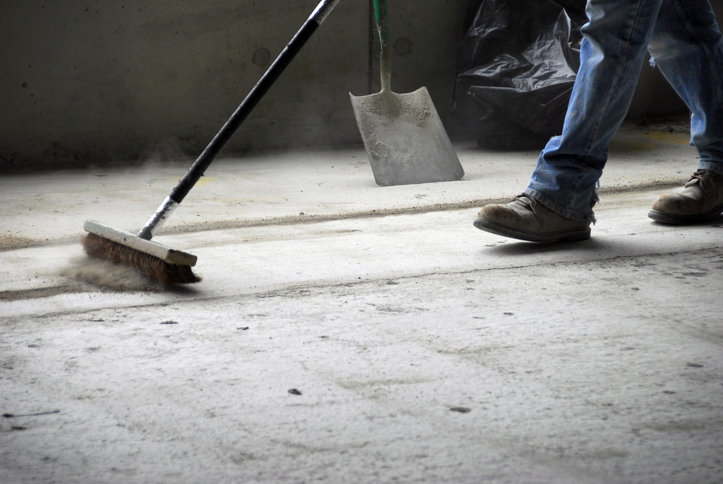 When you clean or remove dust or dirt with a broom, brush or something similar, you sweep. You also sweep if you clean or clear a surface or a space with a broom or brush. To pass over a surface with a continuous movement is also to sweep. Sweep also means ‘to carry by steady force, like waves or wind,’ ‘to search an area thoroughly,’ or ‘to direct your eyes over a region.’ In US English, if you win every round or game in a sporting or other contest, that’s also to sweep. As a noun, a sweep is the action of sweeping and the steady, driving motion of something moving with force. Paul swept the dust from the shelves. Wendy is sweeping the floor. The train of the bride's dress swept the floor behind her. The fast-flowing river swept everything in its path. The police swept the building. Julian swept his eyes across the desk, looking for the documents. The team swept the championship series and brought the trophy home after game 4. Could you give the floor a sweep? Sweep can also mean ‘to examine electronically,’ as someone might do if they were looking for a hidden listening device, for example. A sweepstakes (more common in US English) or sweepstake (more common in UK English) is a type of gambling where a group of people bet on something and the person who wins gets all the stake money contributed by the members of the group as his or her prize. The origin of sweep, meaning ‘to clean with a broom,’ is uncertain. Some linguists believe that it dates back to before the year 900, and comes from the Old English verb swāpan (to sweep), which directly evolved into a different English verb (now obsolete), swope. Others prefer to think that it dates back to the late 13th century, as the Middle English swepen, which could have derived from the Old English verb or from swope, come into English from a Scandinavian source, or perhaps a combination of both. The sense ‘to perform the act of sweeping’ appeared in the mid-14th century, and ‘to collect by sweeping’ is from the late 14th century. Sweep has also been used figuratively to mean ‘to hasten, rush or move swiftly’ and ‘to drive quickly, impel or move by force’ since the late 14th century. The sense ‘to clear something away’ dates back to the mid-15th century. The US sports sense, ‘to win all events,’ dates back to the 1960s and came from a similar use of the noun; ‘to systematically pass over or search for something,’ from the mid-1960s, also came from a specific noun use. The expression to sweep someone off his or her feet dates back to the early 20th century. The noun, which originally meant ‘stroke or force,’ dates back to the mid-13th century, and came from the verb. The meaning ‘the act of sweeping’ appeared in the mid-16th century, while ‘a range or extent of continued motion’ is from the mid-17th century, and has been used in relation to military or police search actions since the mid-18th century. The sense ‘winning all tricks in a card game’ is from the early 18th century, and extended to other sports (and the verbal sense) in the 1960s. This is also where the word sweepstakes came from. Sweep, short for chimney-sweep, was first used in the late 18th century.